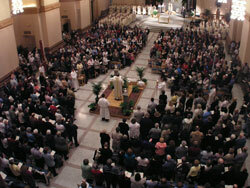 This office fosters the renewal and growth of liturgy in the archdiocese. It offers consultation services, training programs, printed, and online resources for parish liturgical ministers. It is also responsible for archdiocesan liturgical celebrations at which the archbishop presides. The Federation of Diocesan Liturgical Commissions (FDLC) has prepared a liturgical preparation aid for Lent, the Sacred Paschal Triduum, and the Easter Season. This forty-eight-page resource for the Great Ninety Days is available in English and Spanish. Permission is not needed to share these documents however, please acknowledge the FDLC and other copyright holders when you do. Thank you.